JANE: Last week we discussed aliens who are not really “aliens,” because they are actually native to Earth and are, in fact, often created by human agency. But this week I want to talk about extraterrestrial aliens. ALAN: It’s an obvious SF topic, and they’ve been there in the stories right from the beginning. But they have often been quite crudely depicted. Generally they were just bug-eyed monsters which were little more than plot devices to allow the hero be heroic by fighting and destroying them. JANE: This doesn’t mean the stories are bad. Sometimes they can be amazingly creepy. I’m very fond of the 1951 movie The Thing, which is based on the short story “Who Goes There?” written by John W. Campbell Jr. under the pseudonym Don A. Stuart. Basically, a UFO is found in the Arctic ice. A military/ scientific team is sent out of study it. Something starts hunting them… I know it’s old-fashioned and has been repeatedly imitated, but I don’t care. I really enjoy it! ALAN: Me too! I’m a sucker for stories like that. Perhaps that’s why I’m so fond of the writer A. E. Van Vogt. He is my very favourite writer of terribly trashy SF. I truly cannot recommend his stories – they have not aged well and are probably best read with your eyes closed so that the words never manage to reach your brain. Nevertheless, I love him dearly. 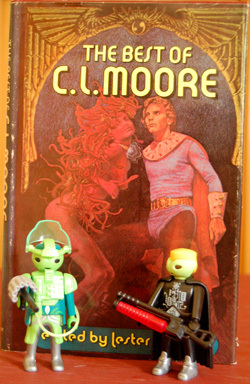 In one of the novellas that comprise the fix-up novel The Voyage of the Space Beagle, we meet an alien who is obsessed with reproducing his race. To that end, he rampages through the space ship, kidnapping crew members and implanting parasitic eggs in their stomachs. The plot is so close to that of the movie Alien that Van Vogt actually sued the makers of the film for plagiarism. The case was settled out of court. JANE: I didn’t know that. I’m not really familiar with the story either… So, do all aliens as creepy monster stories belong to the benighted past? I mean, we’re both talking about stories from the 1930’s. JANE: Good to know… I haven’t read these but it sounds as if they would do very well with the new interest in “cli-fi” (or SF dealing with climate change and related issues). I think before we move on to the more sophisticated aliens, we should acknowledge that movies and the need for simple, cheap costumes popularized the BEM element in SF as much or more than print. “Monster” movies are perennially – and cross-culturally – popular. What’s funny is that every wave of advance in special effects (and one could consider film itself a special effect, since drama has a very old heritage) seem to breed a new wave of such movies. Probably the earliest example of an alien that had more sophistication to it was in Stanley G. Weinbaum’s short story “A Martian Odyssey,” which was published in 1934. It completely changed the way writers (and readers) thought about aliens. The Martian creature Tweel that Jarvis and the other explorers from Earth meet in the story is so alien that they really have little insight into his/her/its motives. For example, Tweel travels in huge leaps and bounds that end with his beak buried in the ground. Why does he do that? We never find out. Tweel does learn to walk like the Earth people so that he can travel with Jarvis at his pace as Jarvis explores. Tweel even learns some words of English, but the Earth people learn nothing at all of Tweel’s language. From beginning to end, Tweel’s actions remain largely incomprehensible, dare I say, “alien”? JANE: Hmm… I’ve got to admit. I’m not familiar with “A Martian Odyssey,” and since your comment pretty much contradicts what I was going to say, I’d better… Let’s see if I have a copy. Ah, yes. It’s the first volume in the Science Fiction Hall of Fame edited by Robert Silverberg in 1971. Can you go walk Jake or something while I read it? JANE: Okay… I’m back. Thanks for mentioning the story. I really liked it – although I suspect the style would be impenetrable to many of our younger readers. I don’t think you did it justice! Compared to some of the creatures Jarvis encounters during his hike with Tweel, Tweel is practically comprehensible. After all, it seems to have a concept of friendship and a desire to bridge a HUGE culture gap. But the critters with the pushcarts… And I loved the walking blades of grass. Perfect for a desert! JANE: However, I think you are wrong about never understanding why Tweel travels so oddly. I thought the story made it very clear why it travels like it does; Jarvis even comments that it’s a very efficient way of using low grav. ALAN: Perhaps I need to re-read the story. It must be at least forty years since I read it. But I think the fact that much of it has stuck indelibly in my mind for so long proves just how powerful a story it really is. JANE: There’s a story that predates “A Martian Odyssey” by one year that some say beats it in presenting an alien who is truly alien. Can you guess which one? ALAN: No, sorry. I can’t. JANE: The story I have in mind is “Shambleau” by C.L. Moore. ALAN: Ah! I’ve not read that one. Tell me more. However, having just re-read both stories in close proximity to each other, I’d agree with you that Tweel in “A Martian Odyssey” is more alien. Shambleau is creepy because she begins as more or less human (which is why Northwest Smith steps in to protect her from an angry mob) but, by the end of the story, she is seen as a truly alien creature. Still, I think Shambleau belongs on the side of horror, while Tweel is firmly within the SF camp. Part of the reason I’d say this is that, while at the end of their respective stories both remain mysterious and incomprehensible, Jarvis asserts that he believes the gap between humans and Tweel can be bridged – the scientific explanation. However, Shambleau is a mystery thousands of years old and we are given to believe, will remain so. So, Tweel is an alien, while Shambleau is a figure of myth. ALAN: And being mythic, Shambleau therefore remains outside of the “rational” universe that SF writers were starting to examine, largely under the direction of John W. Campbell, the hugely influential editor of Astounding magazine, (later Analog). Campbell famously challenged the writers who submitted stories to his magazine to: “Write me a creature who thinks as well as a man, or better than a man, but not like a man.” But Campbell did not take over the editorship of Astounding until 1937 and it was several years before he really hit his stride. So Weinbaum’s story clearly pre-dates the Cambell era. Indeed, it may well have been the story that inspired Campbell’s challenge in the first place. But after Weinbaum’s story, there was really no excuse anymore for the cliched BEM. JANE: Or perhaps rather than saying, “no excuse” since there’s always room for a good monster story, we should say that there was now room for more elaborately constructed aliens. Maybe next time we can take a look at some of these! This entry was posted on September 17, 2015 at 1:00 am and is filed under Thursday Tangents. You can follow any responses to this entry through the RSS 2.0 feed. You can leave a response, or trackback from your own site. Sadly, I’m not a huge fan of Peter Watt’s work, but he’s definitely pushed the edge on writing truly alien aliens. I agree with you. I’m not a fan either, but from what little I’ve read of his stuff, he does do weird aliens. I’ve been on many a panel about designing alien characters, and everyone seems to agree that while aliens that are too human are boring, aliens who are incomprehensible are useless as characters, although fine as plot devices. Designing aliens makes for a delicate balancing act, for exactly the reasons Jane cites. Plus the fact that we’ve never seen any, and have nowhere really to start. It’s totally wide open, and yet must fit the story they’re in. At some point, we reach a level of absurdity here. Most people have no idea how diverse life is on Earth, so what passes for alien in SF seems to be mostly about whether it’s near the edge of the acceptable canon of alien life that’s been portrayed in SF. That’s a pretty narrow, and to be blunt, highly stylized category. Ants. We all think of ant hives as ruled by the queen in human fashion, right (cue the analogy to Indian castes, with alien workers knowing their place and happy in it). Wrong. The queen is the gonads, except in cases (google gamergate ant, and ignore the references to Gamergate) where there are also fertile workers. Decisions are made collectively by the workers through something like quorum sensing, but more complex. How often do we see this kind of eusocial alien? Dogs? Love the smell of rotting meat and obsess how well your friends’ GI tracts are functioning, hate floral perfumes, and see the world through your nose? Yeah, dog-like aliens are more often portrayed as tough and loyal. I suspect that “aliens in SF” have about as much to do with the diverse reality of life on Earth as flower gardens have to do with the diversity of flowering plants. In other words, 99.9% of the diversity that’s out there is ignored, people look for the stuff that looks good in their walled, intellectual garden, they generally get their landscaping ideas from their friends, and selections tend to be clones of each other, with few people venturing outside the wall to see what else exists. Perhaps that says something about our species’ biology? Neat comments. Certainly much worth considering.